With the City of Ottawa specifying Redi-Rock, or an approved equivalent gravity wall, M CON Products approached Goldie Mohr and proposed Stone Strong Systems, for the strength and durability, ease of installation, as well as the pleasing aesthetic design. Laying the base layer. Project Showcase: Goldie Mohr’s Rideau River West Pathway, Ottawa, ON. Stone Strong Systems prepped for laying into the project. 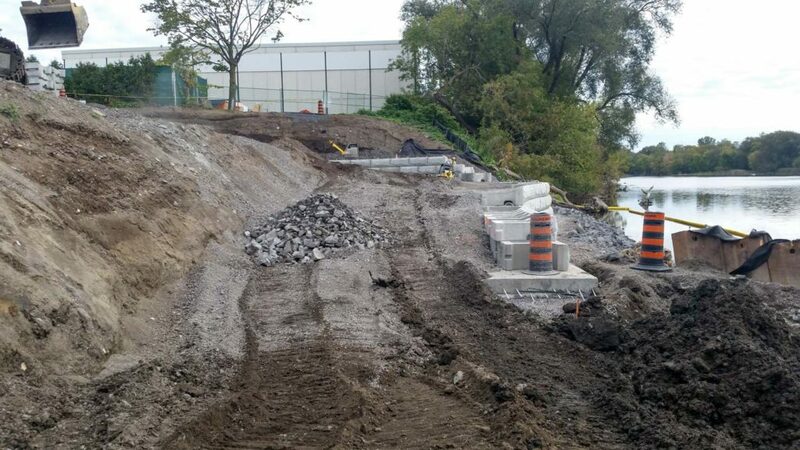 Project Showcase: Goldie Mohr’s Rideau River West Pathway, Ottawa, ON. Each layer builds into the next with little to no adjustment needed. 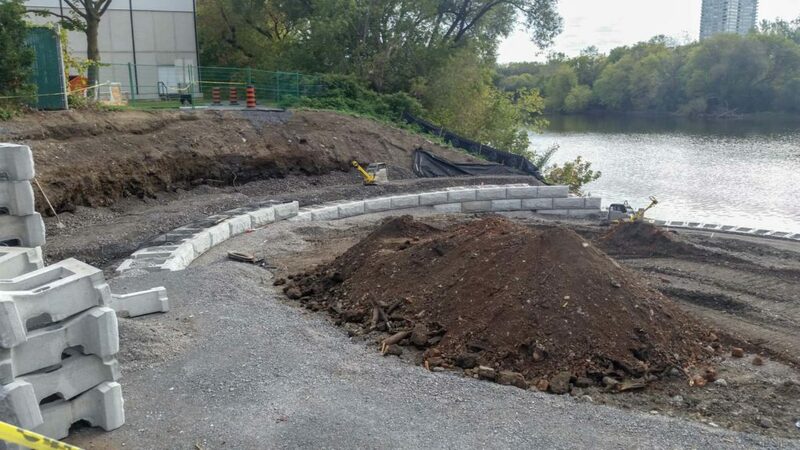 Project Showcase: Goldie Mohr’s Rideau River West Pathway, Ottawa, ON. Once grading is completed and the base bedding layer is set, this stretch will be ready for the wall blocks. Project Showcase: Goldie Mohr’s Rideau River West Pathway, Ottawa, ON. The blocks come together seamlessly to build a functional and visually appealing backdrop for the pathway. 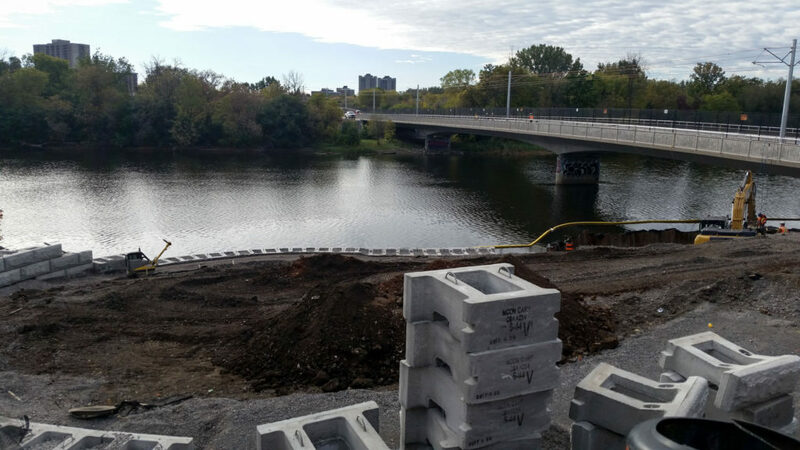 Project Showcase: Goldie Mohr’s Rideau River West Pathway, Ottawa, ON. 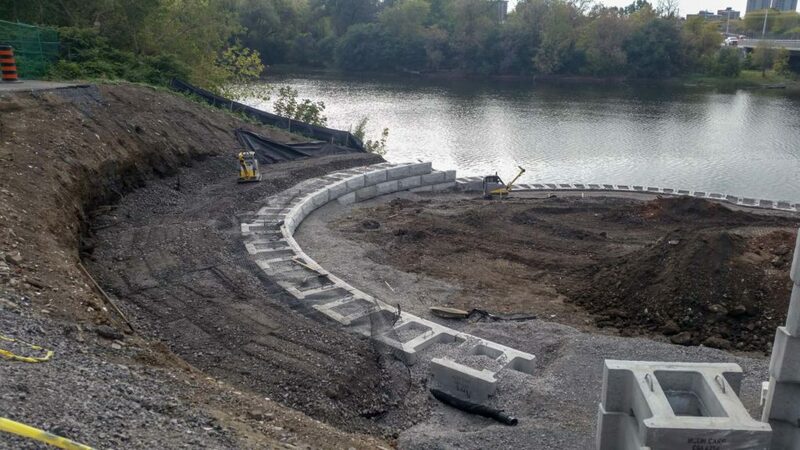 Functioning as a retaining wall for the waterfront on the left and a pathway border on the right, Stone Strong’s versatility provides solutions for every design requirement. Project Showcase: Goldie Mohr’s Rideau River West Pathway, Ottawa, ON. The hollow cavities of the blocks allow quick installation of fencing. Project Showcase: Goldie Mohr’s Rideau River West Pathway, Ottawa, ON. The consultants and engineers were impressed by the alternative product we were able to offer, and Paterson Group made the decision to proceed with the design. Once the final design was approved and the project given the green light, M CON Products was well stocked with the blocks and were able to expedite the large and complex installation faced by Goldie Mohr. Being able to overcome the design difficulties of the wall containing multiple bends and a great variation of blocks, the installation of the wall was completed quickly and with very few obstacles.